On June 10, 1950 Anna Maria Szmeterling is born in Poznań. At the age of 4, she begins to take piano lessons and later as a student in a school of music she tours with Poznan’s Philharmonic Society. She perfected her musical skills with amateur band Szafiry created by Piotr Kuźniak. She begins cooperation with student theatre “Oktawa” and clubs “Nurt” and “Od Nowa” where she sings and accompanies. In January 1969, Anna Szmeterling takes part in Student Song and Singers Festival in Cracow and presents a song entitled “A lipiec grał“ written by Jacek Szczygieł and Tadeusz Kubiak and her own song with lyrics written by her brother Roman Szmeterling “W płaszczu z mżawki i zadumy”. With a hit song “Najtrudniejszy pierwszy krok” sung at the XI National Festival of Polish Song in Opole Anna Jantar launches her solo career. In 1974, she receives multiple awards and distinctions. At the International Song Festival “Slovenska Popevka” in Ljubljana she receives a special honor for the interpretation of a Yugoslavian song entitled “Czas jest złotem”. In Kołobrzeg at the VII FPŻ, she is the recipient of Polskie Nagrania award and receives the title of “Miss Obiektywu.” At the “Coupe d’ Europe” in Austria along with Marianna Wróblewska and Tadeusz Woźniak she receives 3rd team award in the performers category. Finally, in Castlebar, Ireland she wins the third place for the song “Tak wiele jest radości” at the IX “Cisco” International Song Contest. At the same time’ her song “ Tyle słońca w całym mieście” becomes the biggest hit in Poland and remains one of Anna Jatar’s biggest hits to date. In August 1975, at the International Sopot Festival there are many reasons to feel satisfied and proud. “This was a real award sweeping year for me: II award of the jury at the Polish day festival for the song “Staruszek Świat”, People’s choice award for the best performances award “The voice of Wybrzeże” award. Sopot Song of the year award for the song” Tyle słońca w całym mieście”. I was supposed to receive photo reporters award, but that would have been too much." On March 3rd,1976 Anna Jantar becomes a mother and names her daughter Natalia. After a short break Anna returns to the stage and at the International Sopot Song Festival she receives a gold record for the long play entitled “ Tyle słońca w całym mieście”. A year later in Television’s studio 2 she receives the same award for the album “Za każdy uśmiech”. 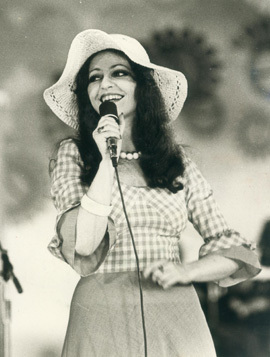 In 1977, she records her third album entitled “Zawsze gdzieś czeka ktoś…” She changes her repertoire and sings more ambitious and challenging songs. With the song “Tylko mnie poproś do tańca” that she sang in January of 1969 at the OIRTV gala- Interstudio 78 in Tampere, Finland she proves that she has become a mature artist. In 1979, Anna starts to work with the bands Perfect and Budka Suflera. The first song recorded together with Budka Suflera entitled “ Nic nie może wiecznie trwać” is chosen as a song of the year in the radio contest by listeners of radio Gama. At the end of 1979, Anna goes on tour the USA. In the winter of 1980, Anna tours Polish clubs in Chicago and New Jersey. “I was delighted to accept another invitation to tour the United Sates which I got after my previous tour in in this amazing country. Touring the USA is tiring for me, but I feel special joy when I meet compatriots who come to see me perform. I get a lot of invitations for social and private functions, but unfortunately I have to decline due to lack of time. I have a lot of work both in Poland and on tour in the USA."